To develop an effective plan, you’ll need a comprehensive and current picture of your community’s needs and assets. What data do you have already about the current state of the problem you want to address? Who is already working to address the problem in some way? Where are the gaps in services? The answers to these and other baseline questions will help you accurately assess the needs you want your initiative to fulfill. Partnership members can divide up these tasks, each taking responsibility for gathering information in the area they know best. “Find Out What’s Really Happening” will help you collect these essential data to support your goal-driven plan. Along the way, you’ll find that you are creating an inventory of available resources and how community members can access them, which may be of help to the service providers in your partnership. 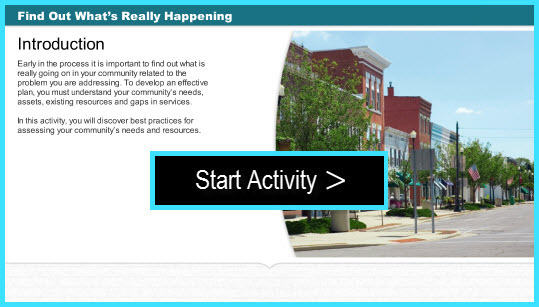 In this activity you will discover best practices for assessing your community's needs and resources.